TheraKey contains a powerful, easy to use set of clinical questions that will greatly increase your effectiveness in a variety of ways. 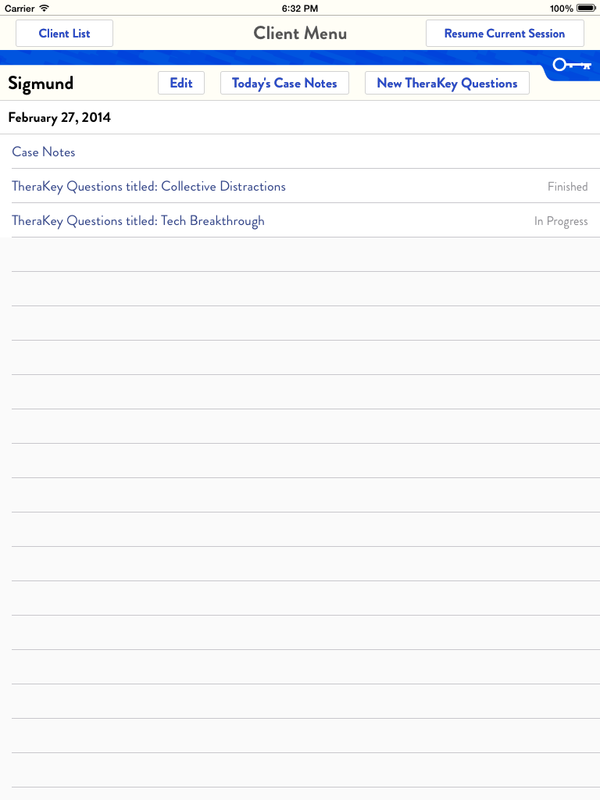 Designed for simplicity, it improves on traditional pencil and paper note taking by collecting answers and automatically inserting them into subsequent questions Clients' answers are also immediately saved and stored for easy retrieval. 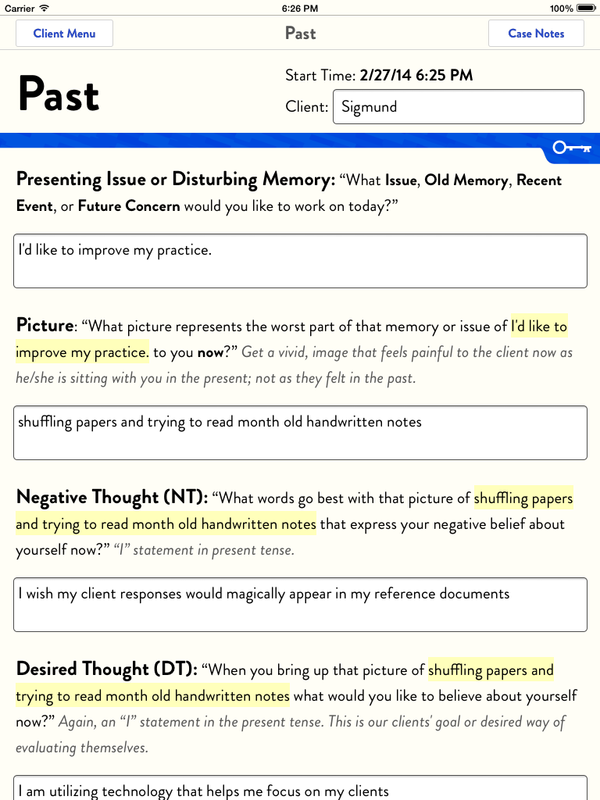 More than a record keeping system for psychotherapy sessions, TheraKey is a set of questions based on the latest knowledge about memory and change, and the ground-breaking work of Dr. Francine Shapiro and her development of Eye Movement Desensitization and Reprocessing (EMDR). TheraKey gives you a meaningful way to vividly access clients' associations in a manner that makes sense to both you and to them, opening the possibility for richer exploration and more positive therapeutic outcomes. We encode our experiences, especially emotional ones, multi-dimensionally. When someone goes through a traumatic or powerful emotional experience, she or he is left with a memory that contains sensory, cognitive, affective and physiological residues. Painful images, sounds, and/or smells are part of the memory. Also, we are creatures who seek meaning in our lives. Thus, we, and our clients, ascribe explanations to the events that occur in our lives. These explanations are often expressed as negative thoughts, e.g., I'm not good enough; I'm bad; I can't handle it, etc. In addition to these images and thoughts, memories are stored with emotions and a body resonance. To understand our clients and to help them understand themselves, we need to bring their painful memories into their awareness as vividly as possible on all these dimensions and Therakey will help you do just that. In addition to the multi-dimensionality of our memories, it is clear that the past, present and future are all related. With our development of the Float Back and the Float Forward procedures, you, as a clinician, have a set of questions that will enable you and your clients to make connections between their past and their current problems and future concerns that they've never made before. The difference between using TheraKey compared to standard forms of inquiry is similar to the difference between viewing something in three dimensional color versus seeing it in two dimensional black and white.